On the morning of April 2, XCMG 700-ton hydraulic excavator rolled off the production line successfully. 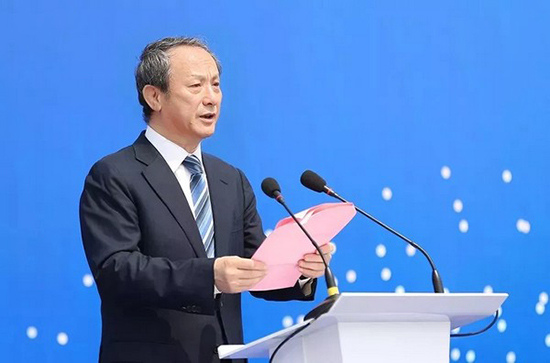 Mr. Wang Min, Chairman of XCMG delivered a speech, in which he highly affirmed the achievements made by XCMG Excavator Machinery Business Division to strive for a world-class brand of the mining industry in China and pointed out XCMG always take the large set of mining machinery as a strategic industry and invested much capital in it. That’s why XCMG mining equipment has perfect cost-effective performance in the market. Honored as “China’s Largest Excavator”, XCMG 700-ton hydraulic excavator is driven by two 1,700-horsepower motors, exceeding the power of two Type 99 Main Battle Tanks. Its weight is equivalent to that of 500 ordinary sedans, and overall length of 23.5 meters approximates to the body length of the largest creature on earth—mature blue whale. With the bucket width of 5 meters and bucket capacity of 34 cubic meters, the bucket can dig more than 50 tons of coal each time the leveraging maximum thrust pressure is 243 tons and stick digging force is 230 tons. The XCMG 700-ton hydraulic excavator can matches with XCMG 240-ton or 300-ton mining tipper. They are called “Mining Giants”, which can load and transport more than 30 thousand tons of coal in 8 hours. The high-efficient operation is an undoubted major breakthrough in mining industry of China. On top of that it boasts “the largest tonnage in China”, the 700-ton hydraulic excavator adopts many exclusive technologies including dual-power assembly coupling control system, high pressure system intelligent monitoring and fault self-diagnosis technology, modularization dual-power hydraulic driving system, and auto-oil supply self-adaptive chassis tension system with 52 independent patents. It has achieved breakthrough in centralized application of crucial technologies for the first time in the field of ultra-large type hydraulic excavator in China, marking that China has become the fourth country having R&D and manufacturing capacity for 700 –ton and above hydraulic excavator in the wake of Germany, Japan and America. Wan Haopeng, Executive Director of Tibet Julong Copper Industry, fully appreciates the advancement and reliability of complete set of mining machinery products of XCMG. In 2017, Tibet Julong Copper Industry introduced XCMG 280-ton electric hydraulic excavator and 110-ton mining tipper, whose performance completely stood up to “extreme challenge” from the Qinghai-Tibet Plateau. With the altitude of 5,400 meters, great temperature difference between day and night, and strong radiation, the mine areas pose high requirements for advancement and reliability of mining equipment. Complete set of mining machinery of XCMG has innovatively overcome ultra-high altitude application technology at home, by which products have reliable quality and high attendance rate, and the performance aligns with that of foreign brands, and the costs of use and maintenance are lower, showing dominant advantages in the open pit mining. In March 2018, XCMG hit an all-time high export of articulated dumper in China with 70 sets（including excavators, articulated trucks, loaders, etc.） to Central Asia and South Africa; Mining machinery of XCMG has successfully entered the high-end market which had been dominated by international giants of Europe, Japan, America, etc. Mining machinery of XCMG has gained favor from more and more customers, depending on prominent performance, reliable quality and service exceeding the expectations of clients; XCMG has become main supplier and significant participant for large-scale excavating machinery and mining machinery in the world, greatly promoting and leading the progress and development of large-scale open-pit mining machinery industry in China.